Spacious double and triple rooms, and studios. All of these equipped with air conditioning, private bathroom, cable T.V.. Rooms with microwave and a fridge are available as well. It has a small, surrounded by a garden, swimming pool outside. Wi-fi is available. Playa El Tunco, Km 42.5 El Tunco main street, municipally of Tamanique, Departement of La Libertad. Approximately 250 meters after entering El Tunco main street and passing next to the gate. Between a private house and Hotel Mopelia or Pizzeria El Tunco Veloz, there is an off-road to the left, the first hotel you'll see it's Eco de Mar. The hotel offer visitors a cafeteria, surf lessons and they also offer rent of surfing equipment, and for an additional fee you could practice yoga or make use of the gym, transfers from and to the airport. Surfing and alternative tours are offered in Spanish, English, Dutch or German. 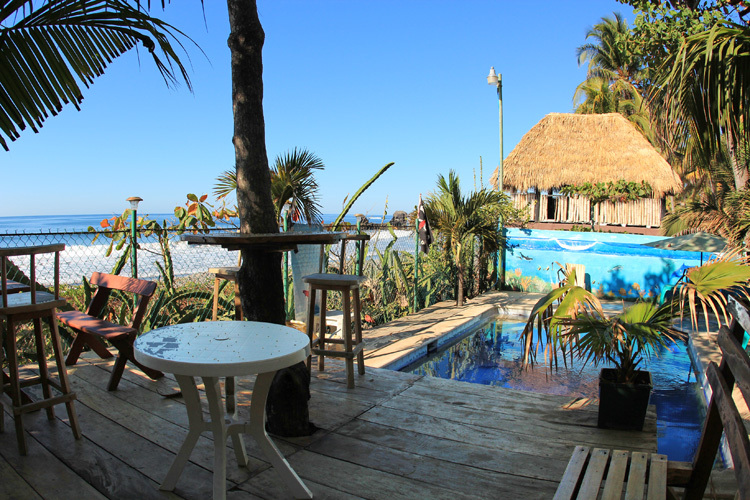 Located directly on the beach in the popular village of Playa El Tunco, if offer double rooms with fan or air conditioning, swimming pool and wi-fi. It has 5 apartments. Rooms are equipped with queen and single beds, air conditioning, private bathroom, cable TV, pool and wi-fi. Prices according to season and number of visitors. Contact Us for more information. Surf school for beginners and advanced, certified instructors with the best programs and courses.